Muskegon, Michigan 49440, will open its doors to the public from 7-11 p.m. Friday, March 21st and from 5-10 p.m. on Saturday, March 22nd. After the weekend updated hours will be added to their facebook page as they determine demand and their beer supplies. 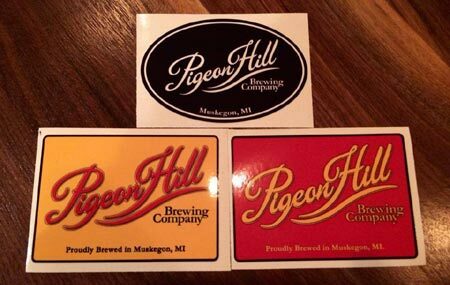 Pigeon Hill’s tap list will feature the Walter Blonde Ale, the 1762 Russian Imperial Stout, the Besto Bohemian Pilsner, the LMFAO (Let Me Fetch An Oatmeal) Stout, the Shifting Sands IPA and the Petite Soleil Saison. The brewery will also offer non-alcoholic pink lemonade and glass bottle Faygo. The brewery will not serve food. During opening weekend they will be limiting the number of people in the taproom to allow for the best experience possible so depending on demand you might have to wait in line outside. Also their bathroom facilities aren’t finished yet so they have provided port-a-potties outdoors as well but they will have beer and they didn’t want to wait for contractors to finish building until they could serve you! Once inside Pigeon Hill brewery look for interesting features brought back and preserved from the local history including tables made with wood salvaged from the bottom of Muskegon Lake from the Lumber Era, a pool table built by Brunswick that was reportedly played on by silent film star and Bluffton vacationer Buster Keaton and light fixtures recycled from S.D. Warren (the Sappi paper mill), Continental Motors Co. and Brunswick Bowling.